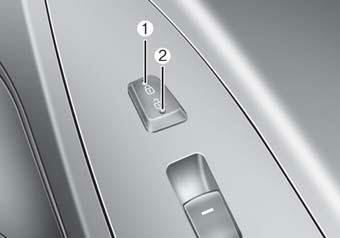 • To unlock a door, push the door lock button (1) to the “Unlock” position. The red mark (2) on the button will be visible. 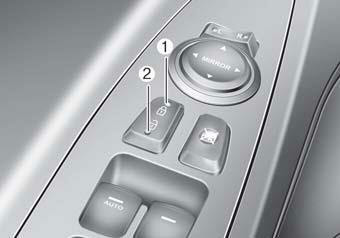 • To lock a door, push the door lock button (1) to the “Lock” position. If the door is locked properly, the red mark (2) on the button will not be visible. • If the inner door handle of the front door is pulled when the door lock button is in lock position, the button is unlocked and door opens. 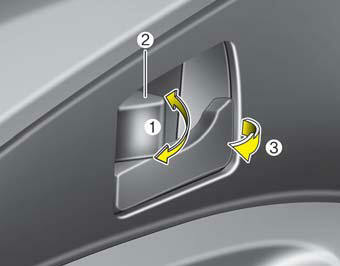 • Front door cannot be locked if the ignition key is in the ignition switch and the door is open. • A door cannot be locked if the smart key is in the vehicle and any door is open. • If the key is in the ignition switch and front door is open, the doors will not lock even though the front portion (1) of central door lock switch is pressed. • If the smart key is in the vehicle and any door is open, the doors will not lock even though the front portion(1) of central door lock switch is pressed. • Be careful when opening doors and watch for vehicles, motorcycles, bicycles or pedestrians approaching the vehicle in the path of the door. Opening a door when something is approaching can cause damage or injury.